Living Gears Help This Bug Jump Planthoppers are champion jumpers — launching themselves upward, hundreds of times their own height, in just a couple of milliseconds. They achieve this feat with the help of cog-like teeth on their legs — the first mechanical gear system ever found in nature. There was a tiny row of bumps on the inside of each leg where it met the insect's body. The bumps looked just like the teeth of gears. And when the planthopper jumped, they acted like gears too — as teeth meshed, the legs turned in synchrony. Sutton says his finding, published this week in Science, is the first mechanical gear system ever observed in nature. He's now a post-doc at the University of Bristol, in England. But while working at the University of Cambridge, Sutton spent a lot of time studying the kicking mechanism of various jumping bugs — grasshoppers, planthoppers, leafhoppers. He would place the insects on their backs and tickle them with a paintbrush to make them kick (the motion was identical to jumping). They kicked fast. While most humans take half a second to jump, the planthoppers only take a couple of milliseconds. To capture that action, Sutton used high-speed cameras shooting at a rate of 20,000 frames per second. To get good exposure at such a high frame rate, he illuminated the insects with lots of bright lights. "You're using so much light that you may end up cooking the animal," Sutton says. Still, he was able to observe a few kicks before switching out the insects. And he noticed something. They kicked with incredible, almost impossible synchrony — flexing within 0.05 milliseconds of each other. That's faster than neurons fire. "So we were asking ourselves, 'How in the world did they get such precise synchrony between the left and the right legs?' " Sutton says. That led to a closer inspection of the nymph's anatomy and the discovery of the gears. The teeth of these natural gears don't look quite like man-made versions. The vast majority of man-made gears follow the same precise pattern, one proposed more than 200 years ago by Leonhard Euler. Euler was a Swiss mathematician, one of the most influential in history. His colleagues called him "Analysis Incarnate." One rhapsodized that Euler "calculated without any apparent effort, just as men breathe, as eagles sustain themselves in the air." Euler wrote dozens of books on mathematics, but still found some spare time to fiddle with gears. He figured out that an infinite number of cog shapes could be used in machines, but Euler settled on one that could be easily constructed by contemporary tools. That shape (seen below, next to Euler's portrait) is still used in most machines today. Thanks to modern fabrication techniques like 3-D printing, engineers are now free to explore less orthodox gear shapes. They are looking for gears that work best for specific applications — as in tiny machines. "There's a lot of debate over how you design these kinds of machine parts over very small size ranges," Sutton says. Planthopper gears certainly are tiny. Each tooth is only about 20 micrometers wide — a fraction of the width of a hair. 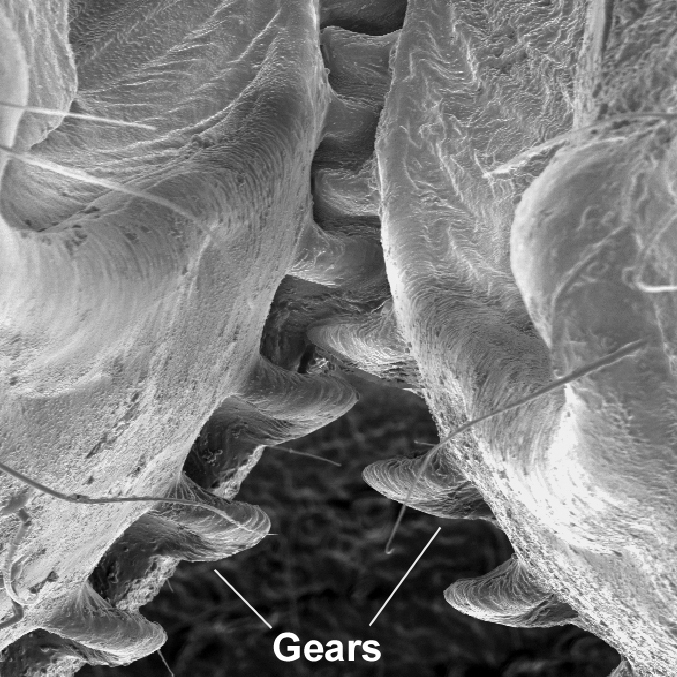 And the teeth of the insect gears are more curved and hooked than typical man-made gears. An image from an electron microscope of the back legs of a planthopper insect. "What we have is a prototype for incredibly small, high-speed, high-precision gears," Sutton says. "And that prototype is given to us by nature." Gear shapes have been discovered in nature before, but until now, none of them has been shown to work. 1. Last year the image below made the rounds on the Internet, purportedly showing gears trapped in an ancient rock. Tabloids trumpeted the discovery of a 400-million-year-old machine left by aliens or time travelers. Nope. Those "gears" turned out to be the fossilized stems of crinoids — aquatic creatures related to sea urchins. (You can see an intact fossil below to the left.) Their relatives still survive in reefs today (below right). 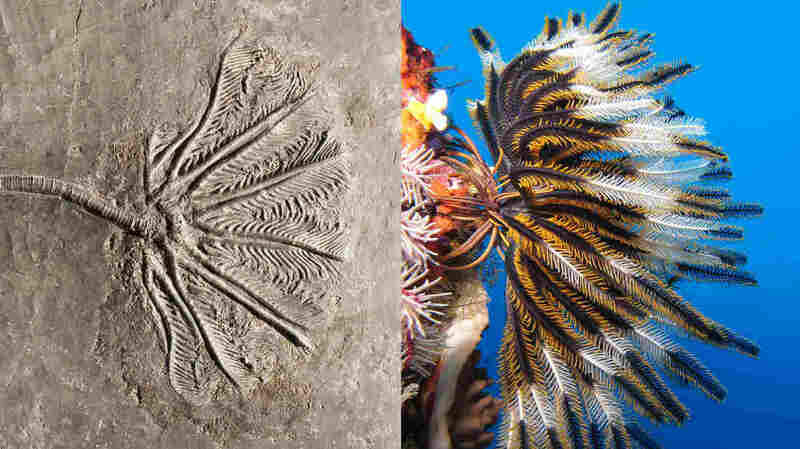 Crinoids are called "sea lilies" due to their plant-like shape. 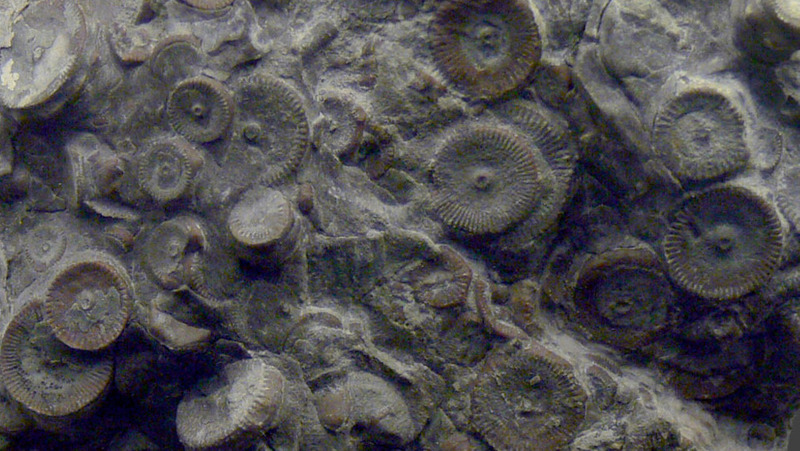 On the left, a crinoid fossil from the late Triassic. On the right, a living crinoid found in a reef of the Batu Islands near Indonesia. 2. 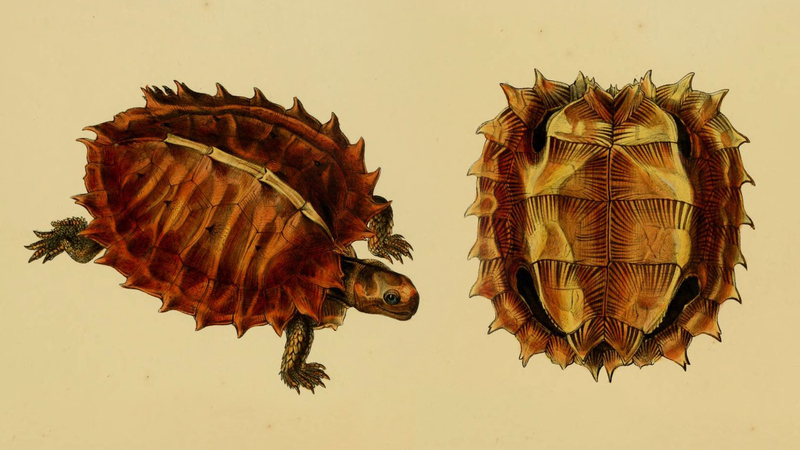 Heosemys spinosa — also known as the cogwheel turtle — is named for the spines on its shell. Members of the species have never been known to pair up, link cog-teeth, and spin in opposite directions ... though that would certainly be an amusing sight. 3. 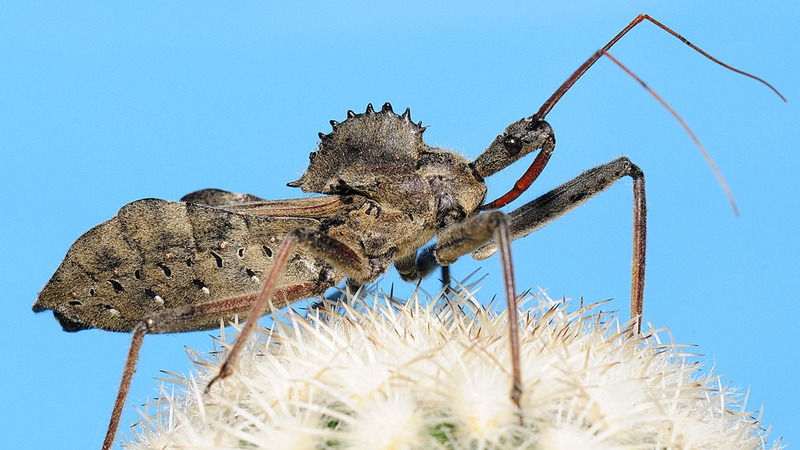 Adult Arilus cristatus — wheel bugs — are equipped with a cog-like plate of armor on their backs. 4. Crocodile hearts have a special valve — called a cog-teeth valve — that helps them regulate blood-flow. The cog-teeth can be briefly glimpsed in the video below, which was taken inside a beating crocodile heart.